The British and Irish Steam Packet Company (known as the B&I) was formed on July 27th 1836 after a group of Dublin business men met in the Commercial Buildings in Dame Street. On October 24th Articles of agreement were concluded between the investors, which included Arthur Guinness, James Ferrier (Transatlantic Steam Ship Company), Richard Williams and James Jameson. One of the Company’s first directors was Francis Carleton (who was also a member of the board of the City of Dublin SP Co. [1823-1924], with whom the B&I worked closely). The company’s first ships were the wooden paddle steamers, The Devonshire, Shannon, and the City of Limerick (all 500 tons), and by December 29th, they were advertising weekly services between Dublin and London, calling at Plymouth. The company soon chartered three more vessels, the Nottingham, Mermaid and Royal William. The Duke of Cornwall joined the other vessels in 1842, sailing from the North Wall, Dublin to London altering with the City of Dublin SP’s vessels on Wednesday’s and Saturdays, calling at Falmouth and Plymouth. The Duke of Cornwall was the last wooden paddle steamer built for the company. The directors of the B&I were one of the first company’s to invest in propeller driven ships when they announced in 1845 that the company was investing in two auxiliary power steam vessels, the Rose and the Shamrock, which were employed on their Dublin London route. In 1850, the Folye was added to the fleet and in 1852 and 1853 the Lady Eglinton and Nile were added respectively. After a very short service, the Lady Eglinton and Folye were chartered for the Crimean war. The Nile suffered a tragic end when after leaving Liverpool on November 28th, 1854 in a very strong gale, she was wrecked, probably on the Godrevly Rocks, between St Ives and Porthreath. In 1860 the company’s offices moved from Eden Quay (where the company crest may still be seen) to 46, North Wall, and also announced the purchase of a small paddle steamer, the Mars, which they ran between Waterford and Dublin. The service was abandoned in 1863, and the Mars was sold to American owners. She was eventually used as a blockade-runner in the American Civil War. In 1870 the B&I bought the Waterford Steam Ship Company’s London service, giving them a monopoly on the route. They also acquired the Avocado (824 tons) and Cymba (654 tons) from the Waterford company. In 1878 the company increased its capital by Â£20,000, and launched their last iron screw steamer, the Lady Olive (1,013 tons), she was sold to Greek interests in 1910. In the same year the company also acquired limited liability, and moved its offices to Sir John Rogerson’s Quay. In 1888 the company introduced a new development, the triple expansion engine, in the Lady Martin (1,245 tons). With the company’s prestige secured, the company began to announce new builds every few years, including the Lady Hudson-Kikahan (1,368 tons), in 1891. The Lady Wolseley (1,462 tons) launched in 1894, the Lady Roberts (1,462 tons) in 1897 and the Lady Gwendolen (2,163 tons) in 1911. These ships were considered among the best in the UK in the years before World War I with 100 saloon, 50 second class, and steerage cabins as well as state rooms, smoking rooms, and bathrooms, and a service speed of 13 knots. During the First World War, the company had two ships built for its Dublin-London route, the Lady Wimborne (1,542 tons), built in Scotland, and the Lady Cloe (1,581 tons) built in Middlesbough, both with a capacity for 70 passengers, and travelled via Falmouth and Southampton. In 1917 the Liverpool Shipping Company, was taken over by the Kylsant Royal Mail Company, and renamed Coast Lines. By the end of 1917 Coast Lines owned all the shares in the B&I, as well as the City of Cork S.P. Co., the Belfast Steamship Co., Burns and Laird, the City of Dublin S.P. Co. (taken over by the B&I in 1920), Tedcastle, McCormack of Dublin (1919), the Dublin and Lancashire Steam Shipping Co (1922), and the Dundalk & Newry S.P. Co. (1926). In 1920, the B&I decided to set up a cartage and motor haulage department in Dublin to replace the company’s horses and use it to collect and deliver the goods carried by their steamers. In 1924 they bought a fleet of six Albion trucks which were still used by the company at the outbreak of World War II. By 1930 the company had a fleet of 30 modern vehicles including a Maudsley motor omnibus. The company maintained their horse fleet in Dublin (which, between 1924 and 1942 won at least one prize each year in the RDS spring show). The 78 horses owned by the company were all known by name while those in Cork were leased. When petrol became scarce during the “Emergancy” more horses were used, afterwards they were retired, with their last horse, Smokey, retiring in 1973. In 1923 the Lady Louth (1,870 tons) and the Lady Limerick were delivered from the Adrossan Dockyard and both took over the nightly service between Dublin and Liverpool. They had accommodation for 80 first class and 90 steerage passengers. On October 28th, 1926 the B&I took control of the Dundalk & Newry S.P Co Ltd. In 1929 the Lady Munster (1,871 tons ex-Graphic) took over Dublin-Liverpool services and was joined by the Lady Connaught (1,869 tons, ex-Heroic) and was followed by the Lady Lenister (2,254 tons, ex-Patrotic), the company also took delivery of the cattle boat, Lady Meath (1,598 tons). The world wide economic depression of the early 1930s had no dramatic effect on Coast Lines. In 1936 the company offered a controlling interest to the new Irish Government, but they declined and B&I remained with Coastlines, a decision the government would soon regret. In 1937 the twin screw motor vessel Leinster (4,300 tons) was delivered from Harland and Wolfe and the Munster (4,300 tons) followed in 1938. Two new castle carriers were also delivered to the company, the Kilkenny (1,320 tons) from the Liffey Dockyard, and the Dundalk (630 tons) built by Adrossan, Scotland, both built in 1937. Coast Lines, being a British company had its ships committed to the European War, and shortly after the outbreak of World War II, the B&I ships were abruptly removed from their normal routes, despite being Irish registered. There was no Irish legislation to prevent the country being deprived of its own ships, and the claim that it was an Irish company didn’t hold across the water. Eventually, SeÃ¡n LeMass set up Irish Shipping to supply the country, while the Lenster was converted into a hospital ship, then a troop carrier, while both the Innisfallen sank after being bombed in Liverpool, and the Munster hit a mine off the Bar in Liverpool, both in 1940. After the war the company began to rebuild its fleet, with the Longford (ex-Lady Connaught) and Louth (ex-Lady Munster) entering service on the Dublin-Liverpool route. In 1948 they took delivery of the Munster, and the Leinster, (both 4,115 tons) and a new Innisfallen (3,705 tons) for the Cork-Fishguard route (the first ship to be fitted with stabilisers, or Denny Brown Stabilisers as they were known at the time). On November 4th, Mrs Lemass named the B&I’s newest addition, the Meath (1,550 tons) built to carry cattle and sheep from Dublin to Liverpool and Manchester. In 1960 they acquired the Wicklow (600 tons) for carrying general cargo. Photographic card of the 1948 Munster (4) (or Leinster (4)) passing the new 1969 Munster (5). long with container ships. The Irish Government therefore took over a fairly outdated fleet (most of which had been shortly after World War II) in 1965, when they bought the B&I (including the City of Cork S.P. Co) from Coast Lines, and the company became truly Irish. The Minister for Transport, Mr Erskine Childers (who later became President) appointed a new board of directors that began to modernise the company. They ordered new car ferries, the MV Munster (5,000 tons, 1000 passengers, and 220 cars) from Norbiskrug Yard, in Pensburg, Germany in 1968. This was followed by the Innisfallen (5,000 tons) in 1969 built in the same yard, and the Leinster (5,000 tons) built by Verolme Cork Dockyard. 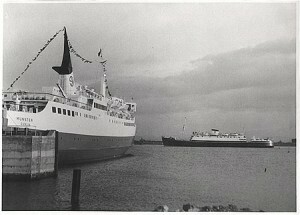 The new Munster’s first sailing from Liverpool was on May 15th, 1968, and took 6hours, 30 minutes, three hours quicker than her predecessor. Meanwhile, in May 1969 the Innsifallen began operating from the new berth in Tivoli, to a new berth in Swansea, while the Lenister started on her Dublin-Liverpool route in July 1969. The company’s freight ships were operating well in the 1970s with the Kilkenny, Tiperary and Wicklow carrying containers to and from Rotterdam and Fleetwood weekly, while the Kildare went to Liverpool and the chartered Nanomark to Le Havre. In 1978 the company ordered a Boeing jetfoil (257 seats) for their Dublin – Liverpool route (they originally considered using a hovercraft, and even set up a sub-company called Irish Sea Hovercraft). 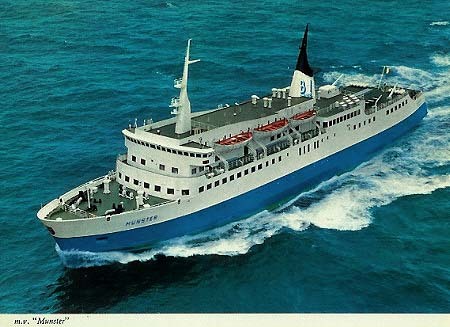 It began services as the CÃº na Mara in early 1980, taking 3hours and 10 minutes making two return trips a day. But her high operating costs, and low passenger figures combined with her poor performance in the bad Irish Sea weather lead to her services being terminated, and the vessel being sold. As of April 2002 she was still sailing in Japan as the Ginga between Niigata and the Sado Islands. On May 22nd 1979 the M.V. Connacht (6,800 tons, 1,500 passengers and 350 cars), which had been launched the previous year had been by Verolme began a new service to Pembrooke from Cork, and moved the Innisfallen to Dublin. Passenger figures for the new Pembrooke services weren’t as strong as those that were to Swansea, as Pembrooke didn’t provide the conveniences that Swansea had. The company then started operating from Rosslare to Pembroke with a series of charted vessels, including the Viking III, and Stena Nordica. They switched the Connacht to Dublin-Liverpool and the Leinster to Cork with three sailings a week. In 1980 the Company ordered a new Leinster (6,900 tons, 1,500passengers and 350 cars), was ordered from Verolme. She took up the Dublin-Liverpool service in July 1981 under the command of Commodore Gerald Barry, who had also been in command of the Munster, the Innsifallen, the Leinster and the Connacht on their maiden voyages. In 1981 the company reported a loss of Â£7.1 million and decided it was time to rationalise their services. They had the Innisfallen cover both the Rosslare, and Cork services to Pembroke. 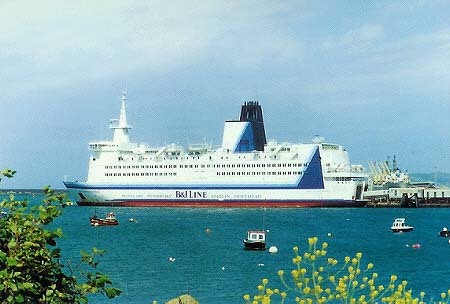 They also started a new service to Holyhead from Dublin, but met with a lot of opposition from the Sealink owned port. On March 2nd, 1981 the Sealink staff used small boats to block the Connacht from docking at Holyhead, and they did the same to the Connacht on the 9th. The crew of the Munster then blocked Sealink’s St. David from docking in DÃºn Laoghaire. The dispute was eventually resolved and the service grew. 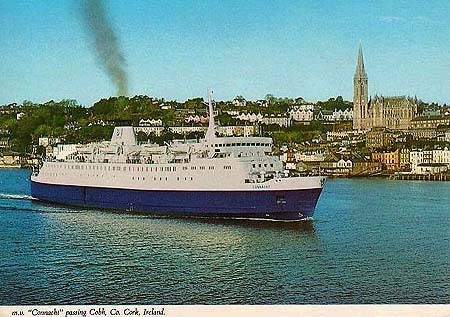 In January 1983 the company’s losses in Cork were too much, and they decided to close the Cork service, but following pressure from the Governmant they decided to keep it going for the summer with a chartered vessel, Silja Lines Fennia. By the end of the summer, they had lost Â£2 Million and the service was closed, only to be reopened by Swansea-Cork ferries a few years later. Meanwile the Munster was sold to Middle Eastern owners, and the company were forced to move their operations from Trafalgar Dock to Blocklebank dock by the Mersey Dock company who were loosing Â£1 Million a year. The last sailing to Trafalgar Dock was made by the Leinster, which also made the first trip to Blocklebank on October 18th, 1983. The B&I’s losses continued to mount however and they agreed to share resources and revenue with Sealink in 1985 in an attempt to maximise profits. The B&I agreed to concentrate there serves on the Holyhead route with the Connacht and the Leinster on her daily Dublin – Liverpool – Dublin route. 1987 saw more trouble, when all the ships were laid up for six weeks due to an officers strike, and the Sealink agreement fell apart. The B&I claimed that Sealink had broken the agreement when they operated a freight only service to DÃºn Laoighre with the Stena Sailor (ex-Dundalk) when they should have used Dublin. Losses continued to mount, with a decficit of Â£100 million, and the company started dropping services. The 152 year old Dublin-Liverpool service was closed with the Connaught making the last sailing on Janurary 6th 1988 and moved her to their new Pembroke-Rosslare route, with her making the the maden voyage on Januaray 12th. After the season ended, she was sold to Brittany Ferries, who renamed her the Duchess Anne, and is still operating in the Adriatic. The company then chartered ships for the Rosslare route, these included the St. Patrick II, The Viking, the Earl Harold , the Norrona and the Cruise Muhibah which the company took a bare charter of for two and a half years and renamed the Munster. ook over the company on the 1st of Janurary 1992. They chartered the Stena Nautica (20,000 tons, 1,840 passengers and 410 cars) for the Rosslare route and renamed her the Isle of Innisfree, becoming the biggest ferry on the Irish Sea.